A whole new batch of turbo trainers were released in late 2018, along with some pretty exciting accessories that make indoor training amazing. 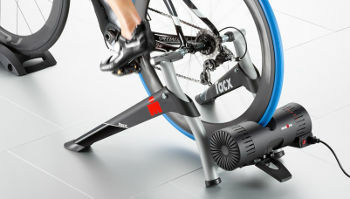 This article is updated to include the very latest turbo trainers are available in 2019. When new trainers come out we will review them and update this article when necessary. Make sure you sign up to the newsletter so we can let you know when we add new turbo trainers and accessories to this article. Here we cover the Best Turbo Trainer in 2019 across three categories. High-end, mid-range, and entry-level turbo trainers. If you want to learn more about the specifics of different turbo trainers then you should read our CYCLE TRAINER BUYERS GUIDE. It covers the different trainer resistance technologies, software, and more. Turbo trainers let you workout indoors whenever you cannot get out on the open road. Also they are fantastic training devices when you want to do specific workouts, such as sprint training. There are lots of options out there and many great trainers. So here we have boiled it down to three of the best turbo trainers for 2019. We have selection a top-end, mid-ranged, and lower priced trainer to suit all cyclists. Nobody wants to train indoors but unfortunately the weather or location can mean it is not possible to get outside on your bike. You want to keep fit so you will want a turbo trainer so that you can still use your bike and get a solid workout. Also, turbo trainers are fantastic for dedicated workout sessions such as sprint or power intervals, and with the advent of specialist software you can start to get data driven workouts or even interact and ride virtual courses against other (real) cyclists. Below we have three categories of turbo trainer. One is for high-end direct-drive turbo trainers, one is for interactive/smart trainers, and the final category is for lower priced entry-level (but still fantastic) turbo trainers. Best High-End Direct-Drive Turbo Trainer. We have a direct comparison between the Tacx Neo and Wahoo Kickr here, you should check it out if you are looking for the best of the best. Also, get our dedicated in-depth review of the new Wahoo Kickr 2 here, and you can read more about the Tacx Neo here on DC Rainmakers website. Instead of a flywheel that most trainers use, the Neo has a virtual flywheel and resistance is controlled via a motor with 32 Neodymium magnets that rotate around 30 coils. The current passing through these coils dictates the resistance that the user can control as they ride, or alternatively software on a tablet/smart phone app or a computer can control. The Neo Smart is perfect for hill training and can simulate inclines of 25%. It pumps out a maximum power of 2200W (which is high) and gives high resistance levels even at low speeds. The NEO is compatible with Shimano, SRAM and Campagnolo gears meaning most bikes will be compatible. 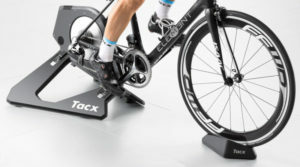 The Tacx Neo Smart trainer is not cheap, costing around a £1000. But as you can see it goes above and beyond in terms of specifications and design and as the saying goes, ‘you get what you pay for’ and this is definitely true with the Neo. It comes with ANT+ and Bluetooth Smart compatibility, meaning it can be paired with speed, cadence and heart rate sensors. Also it works seamlessly with software on smartphones, tablets, and computers. Tacx have their own amazing virtual software where you can ride famous cycling routes & stages from events, compete against other cyclists and much more, When you go up hills the Neo automatically increases the resistance so you need to push harder, and when you reach the summit and start descending the trainers resistance seamlessly changes. Oh, and the Neo can be used with or without mains power, which makes it incredibly flexible. Without mains connection the Neo behaves as a standard standalone trainer and with mains connection is it a high-end electronically controlled (interactive and virtual reality) turbo trainer. See more details and compare best prices here. 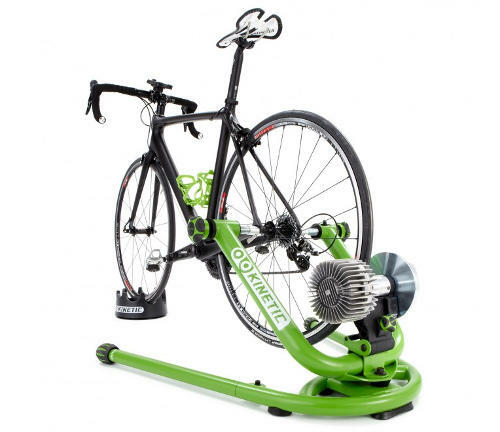 Direct-drive indoor cycle trainers differ from traditional trainers in that you remove your back wheel and fix your bike directly to the trainer. There are some advantages and disadvantages of doing this. Lets start with the disadvantages. Well to be honest the main one is that you need to remove your back wheel (and put it back on again afterwards), which for some people may be a bit of a hassle. However, if you are looking to use the trainer for extended periods of time and do not need to but the back wheel back on regularly then this is not a big issue. There are a few advantages. One is that you eliminate any tyre wear and tyre noise that occurs when using traditional trainers. Tyre wear can be a big issue if you are using turbo trainers for extended periods of time, however you can purchase special trainer tyres that are smoother and more wear resistant and is recommended if you are someone who will use your trainer regularly. Another advantage is that you are driving the resistance unit of the trainer directly via your bikes chain, which will give you 100% power transfer. Traditional trainers that rely on your back tyre spinning a cylinder are not as efficient, although the actual effects of this in reality are likely minimal. Anyway, back to the trainers themselves. If you are in the market for a direct-drive turbo trainer and want the best you can get then you should look seriously at the Tacx Neo Smart Trainer. While direct-drive trainers have their advantages there are benefits of the traditional wheel on roller trainer where you keep your back wheel on. Check out our 2017 Guide to Turbo Trainers to learn about all the different types of trainer available. 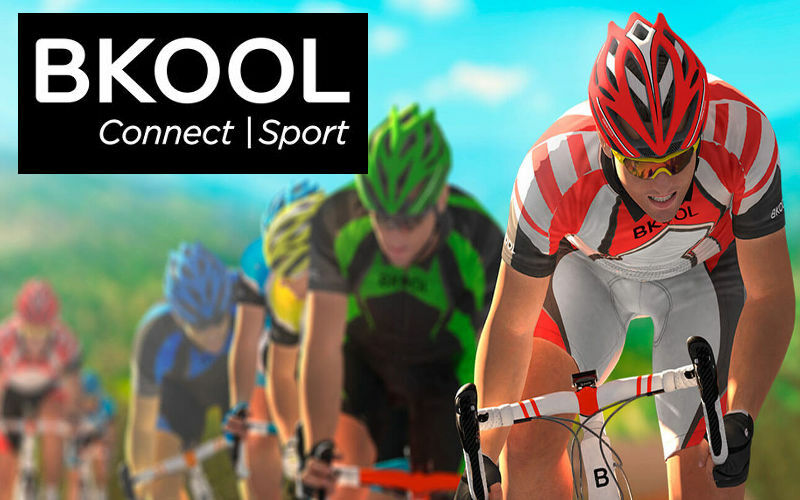 If you want to high-end trainer that comes with all the bells and whistles then you should consider Bkool. They are lower cost that other comparable trainers but pack the same punch. Amazing interactive software, auto-controlled resistance, online races and more. Best Mid-Ranged Standalone Turbo Trainer. The Kurt Kinetic was the choice for the 2015 / 2016 season and it has undergone some improvements for the 2016 / 2017 season. Most notably the trainer now has the option of a ‘Roll Smart Control’ that turns the standard trainer into an interactive software controlled trainer. However, this ‘Roll Smart Control’ is not necessary if you want to simply ride your trainer without being controlled via software, and the Kurt Kinetic Rock and Roll is still a top choice. In 2016 / 2017 CycleOps have improved their turbo trainer range, but one of their classics, the Fluid2 is still up there as one of the best in the mid-priced range. We have an in-depth review of the CycleOps Fluid2 here. Some people prefer a more simplistic experience and just want to get a solid and realistic workout, this is where standalone turbotrainers come into their own. Away from the high-end and very expensive cycle trainers you get the most realistic and smooth riding experience from a fluid resistance unit. What this means is that as you power the trainer a fan or blade is rotated through a fluid whose viscosity has been specially calculated to return a resistance that is very similar to what you would experience when riding outdoors. The resistance or power curves of fluid trainers are non-linear, meaning when you apply more power and spin your back wheel faster the resistance you feel increases exponentially. Fluid trainers are not the cheapest on the market, but this is because the technology within the trainer is more advanced when compared to lower priced magnetic trainers. 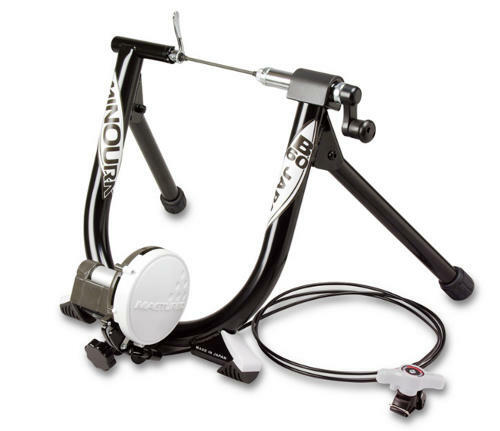 Kurt Kinetic make solid and reliable turbo trainers and the Rock & Roll is their best trainer. It costs around the £400 mark (slightly less), so for that kind of price you expect it to offer more than other lower priced trainers. It is a fluid turbo trainer and therefore provides a realistic riding experience, but the Rock & Roll has one feature that sets it apart from other trainers out there and that is that it is mobile. The whole trainer (and thus your bike) can tilt from side-to-side as you transfer your body weight as you cycle. When you are taking it easy you are quite stable, but when you get out of the saddle and really push yourself the trainer tilts and rotates just like it does when you sprint or push yourself on the open road. As you can see in the video above the riding mechanics are amazing with the trainer (and bike) effortlessly moving around as you cycle. 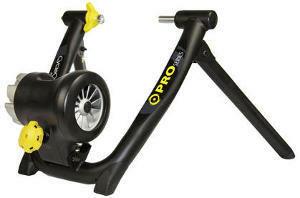 Also you can see that this is not just a bog-standard cycle trainer, it is a smart trainer. As standard with this version of the Kinetic Rock & Roll it comes with inRide sensor technology already setup, meaning you can use the Kinetic app-based power training on your smart device (phone or tablet). With the app you can do intervals, threshold, or recovery spins, and when you combine this with the ultra smooth and realistic fluid resistance it makes the Kurt Kinetic Rock And Roll 2.0 Smart Trainer hard to resist. The trainer itself is particularly well built with a heavy and robust frame. While not a cheap trainer you can definitely see the build quality is superior to others on the market. Read the full review and see the latest prices for the Kinetic Rock & Roll Smart Turbo Trainer here. Best Low Priced (Entry-Level) Turbo Trainer. Having a high-end turbo trainer with all the bells and whistles is great, but sometimes a standard trainer that does what it says on the tin is all you need. If this is the case then you will want a less expensive turbo trainer. There are some real budget trainers available, as discussed in our ‘Top 3 Best Budget Turbo Trainers Under £60’ article, and while these trainers are great you will get a better quality trainer from an established brand if you pay a little bit more. Not much more but around the £100 mark. The B60 is a hugely popular trainer by a trusted and long standing cycle trainer brand. Attaching your bike is very easy and you will be up and running in no time, plus when you are not using the trainer the legs fold and it can be put away in a corner easily. A great feature of the Minoura B60 is its handlebar mounted shifter that allows you to select from 7 different resistance levels so you can either have a relaxed cool down ride or a more intense high resistance workout. Also while an entry-level trainer that looks relatively basic the Minoura B60 actually has a very smooth ride and is pretty quiet. So all in all for around £100 this turbo trainer is an absolute bargain and should be looked at seriously if you was a simple standalone entry-level trainer. 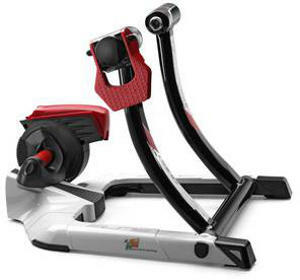 See the best prices for the Minoura B60 Remote Trainer here. Lower priced trainers tend to use magnetic or wind resistance in their braking units. Wind is the most simple technology where your pedaling power goes into spinning a blade/fan and it is the resistance of this spinning blade/fan against this air that causes a resistance as you pedal. While relatively simplistic wind trainers are actually pretty smooth and comparable to the more expensive fluid trainers, such as the Kurt Kinetic Smart Trainer discussed above. However wind resistance comes at a price, and that is noise. They can be very noisy, particularly when you really get the fan spinning so this is an obvious negative factor if you (a) don’t like too much noise or (b) the noise will upset people around you such as neighbours or partners/family. Simple magnetic resistance is your next best option when it comes to lower priced trainers. Magnetic resistance is great and basically you have a spinning metal plate (powered by you as you pedal) which spins relative to some magnets. Things called Eddie currents are generated and cause resistance to the spinning plate and thus you as you pedal. The Minoura B60 uses magnetic resistance to provide a smooth and quiet workout. There are lots and lots of trainers out there for you to look over, but just to make life a little easier we have hand picked 3 turbo trainers that are up there with the best. The Tax Neo is really high-end and hooks up with all the cool virtual reality software and automatically controls your resistance depending on which hill you are cycling up or which workout program you are doing. Also the Neo can be used as a standalone trainer too. If you want a road-realistic trainer then the Kurt Kinetic Rock & Roll is one of the best available. It has a patented frame that rocks and rolls as you cycle to add that extra level of realism. Finally if you just want a good solid and reliable workout without paying several hundred pounds the Minoura B60 is the easy choice. Solid, smooth, variable resistance and quiet. Other trainer options to look at.